Oscillate Wildly is a catchy instrumental by The Smiths that you might want to listen to in an effort to calm yourself as market volatility ratchets up. In a post back on May 16 that I dubbed Comfortably Numb (after the Pink Floyd song), I noted that volatility across all asset classes had been low and falling for months and that investors risked being lulled into complacency by huge central bank liquidity injections. when weaker than expected growth caused a spike in equity volatility and a sharp correction in overvalued equity markets. I suggested that since it was difficult to determine which of these scenarios would play out, that the prudent course of action was to trim risk exposures across all asset classes and temporarily move into cash. This seemed a good choice because, as I noted, "When the inevitable rise in volatility occurs, it will be possible for the investor to analyze which scenario is playing out and, once it has run its course, where to put the cash back to work". The recent spike in equity volatility and sell-off in global equity markets is not a straightforward case. It began after Fed Chair Janet Yellen gave a balanced speech at Jackson Hole that noted the strengthening of US growth and progress toward reducing labor market slack. The speech spooked markets into thinking that the Fed might hike rates sooner than expected. Bond volatility rose as bonds sold off, while equities hung in relatively well through mid-September. But as September gave way to October, market concerns shifted to the weakness of global growth, especially in the Eurozone and to the continuing drop in commodity prices. As growth concerns gained the upper hand equity volatility spiked and global equity markets sold off sharply. In a September post entitled Exit Ennui, I compared the current selloff across asset markets with the selloff witnessed in the spring of 2013 associated with the Taper Tantrum. It's interesting to update that comparison today, after a particularly bad day for global equity markets. The two episodes had several things in common. Both were triggered initially by concerns about a shift to less accommodative US monetary policy. 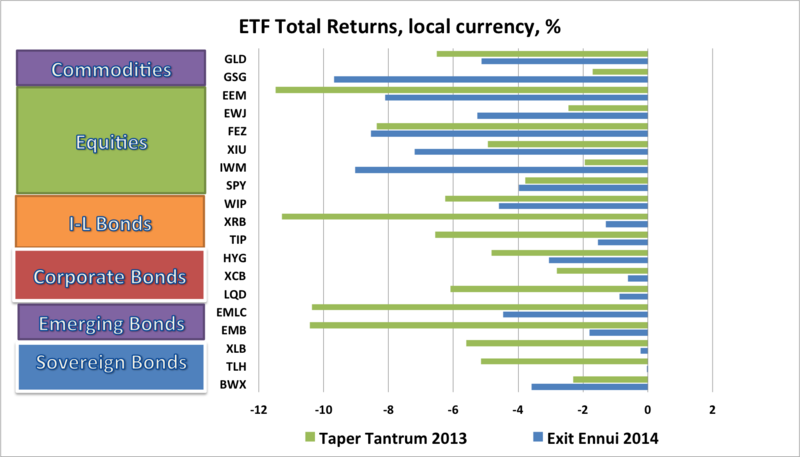 Both saw declines across all asset classes, as illustrated in this chart which shows local currency returns on the ETFs tracked regularly in this blog. The drawdown in equities in the Exit Ennui selloff through October 8 is similar or worse than in the Taper Tantrum. The S&P500 ETF (SPY) has suffered a similar loss. Other DM equity markets, including Canada (XIU), Eurozone (FEZ), Japan (EWJ) and US Small Cap (IWM) have suffered worse losses than in the Taper Tantrum. The commodity ETF (GSG) has also experienced a much sharper loss, reflecting the downside surprises on global growth. Fixed income ETFs, which fared poorly through mid-September have rallied back as global equities sold off. US and Canadian long bond ETFs (TLH and XLB) are back to close to flat since the beginning of the selloff. Inflation linked bond ETFs have sold off much less than in the Taper Tantrum, as have Emerging Market bond ETFs (EMB and EMLC) and corporate bond ETFs (XCB, LQD and HYG). The movements in these ETFs tells me that what started out as an early Fed tightening scare has morphed into a global growth scare. Markets are pushing back expectations of when the Fed will begin to raise rates once again. For Canadian investors in global ETFs, the pain of the selloff has been mitigated somewhat by the coincident weakening of the Canadian dollar. In the Exit Ennui selloff, the C$ has weakened 2.8% vs. the US$, more than double the 1.3% it weakened during the Taper Tantrum. 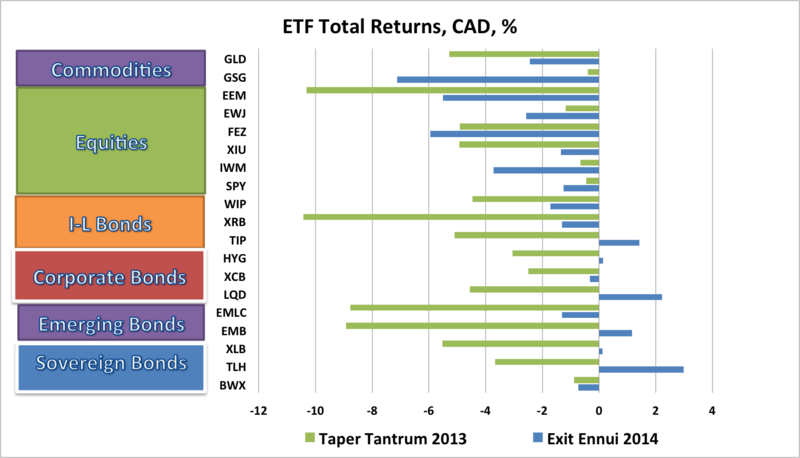 This has meant that the drawdown triggered by Exit Ennui is taking a different shape from that of the Taper Tantrum as shown in this chart of ETF returns in Canadian dollars. The chart clearly shows that in the Exit Ennui drawdown, which began with a selloff in bond markets, the best place for Canadian investors to hide has been US dollar denominated bonds. 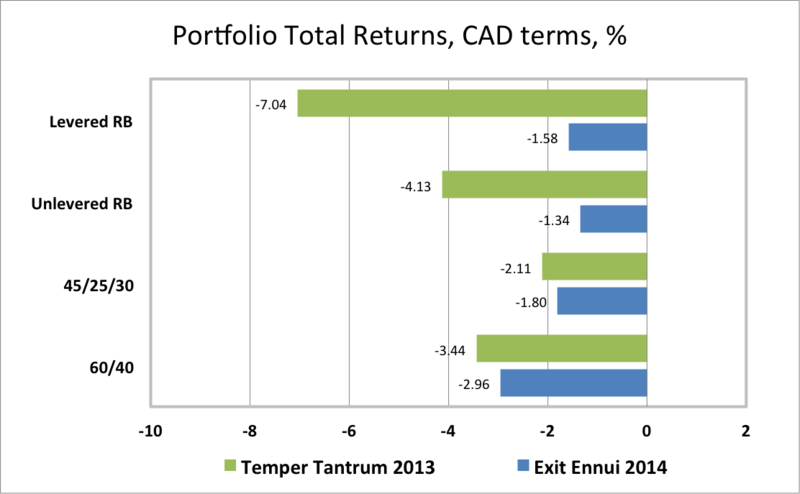 As a result, risk balanced portfolios have performed better than a conventional 60/40 portfolio in the Exit Ennui drawdown. It is still too early to draw a conclusion about the current drawdown and to redeploy cash. The main question that needs to be answered is whether the slowdown that is engulfing Europe, Japan and many of the emerging markets will spread to the US, UK and Canada. If so, US and global equities have considerably more downside. If not, and growth in these countries proves resilient, equities may stabilize, but bonds could come under renewed pressure. Those who took the prudent advice can sit tight and listen to Oscillate Wildly.